For tips on amplified playing with a microphone and all technical specifications please >download the operation manual! The basis for the second version of the Hyperamp MK II was the primary Hyperamp that was build by the HDB-Electronic GmbH in Erlbach (>www.haller-amps.com), just around the corner from the SEYDEL factory in Klingenthal/Germany seven years ago - designed together with harmonica players to produce the typical much-loved Chicago sound. Like the new MK II the original Hyperamp was a handwired 15 watts tube-driven vintage class A amplifier that was handmade in small numbers. 1) There is now a combined input for XLR and guitar jack instead of two seperate connectors - this makes sense since the Hyperamp is a single channel amp and only one mic can be plugged in. Inside the amp and behind the XLR-input there is a built-in impedance transformer so that you can easily use low-impedance mics with the right volume output through the hyperamp's XLR input. The EQ (bass, middle, trebble) works much more efficiently if you use modern mics with a more linear frequency response, like standard dynamic mics for singing. Now the hyperamp can deliver a punchy vintage sound out of a low impedance mic as well. Vintage (harmonica) mics with their high power output miss frequencies in the low and the upper high range, so you can get additional bass out of them only if you play them extremely cupped....these, mostly bullet type mics produce a very dynamic sound that depends strongly on the player's microphone holding technique. These mics can be used with the usualstandard guitar jack input on the hyperamp. 2) Gain control (additional ECC81-tube inside): This control allows a warm and punchy distortion sound even at low volumes. At high volumes the power amp produces the beloved Chicago sound (Volume put to more than 12 o'clock position) - even then it is possible to spice up the sound with even more distortion by using the gain-control. 3) AUX-In: Many customers who own the first version of the hyperamp made suggestions what features they would love to add to their hyperamps: first, they wanted to get tube-distorted sound even at low volumes (see 2) and second, they wanted to have the option to run their mobile phone/mp3 through the amp for rehearsing at home or for little solo gigs. That is why we added the AUX-input that works absolutely independently from the rest of the amp - volume of the play-alongs must be adjusted on the mp3/mobile and the resulting volumes are loud enough to have fun at home or to play a small solo gig. 4) The former DI-Out is now a line output: Only few players used the DI-output at the back of the amp - normally instrumental amplifiers are recorded with microphones in front of the speaker instead of using the direct out - but in certain studio settings a line-out can be very helpful - it can be found on the back panel of the Hyperamp MK II (guitar jack). 5) Restriction of the reverb range for better control: The Hyperamp has two volume controls, one for the original signal and one for the reverb/effect signal. On the original version of the hyperamp the reverb times could be set to be extremely long - at high volumes the sound was not controllable anymore and the result was a totally unmusical noise - therefore on the MK II we restricted the reverb time range to realistic values - it still can be set to produce very extreme reverb but the sound is now much better controllable even at high volume - completely uncontrollable 'spacy' settings are no longer possible. 6) The additional screw-adjustable support in the middle bottom front: A tripod cannot wobble - same effect with the Hyperamp MK II if you unscrew the extra support at the bottom. Additionally the tilted position of the amp helps to hear oneself better on stage and the sound projection to the audience is improved a lot as well. The Hyperamp HA1510 REV MK II combines today's technology with vintage design in an amplifier that surpasses the rest. The Hyperamp sounds warm and punchy at the same time - it is a handwired Harmonica Tube Amplifier with built-in vintage (tube) reverb - made in Germany. The Mark II (second version) was designed based on real feedback from Hyperamp MKI users (the detailed operation manual can be found in the Tips-section). Customer's comment: "As a harp player of many years, I would like to say how wonderful I find your Hyperamp, I have never played such a fine sounding amplifier as this and I've tried lots over the years. Thank you for making this awesome product." Simon B. 1) The Gain + Volume controles now allow you to produce the most popular warm and beefy Chicago sound at lower volumes – low or high-impedance microphones can be used with adjustment capability that allows you to control the "crunch". 2) The new AUX-IN input on the front panel can be connected to any mp3-player or other audio sources. You can play along with your favorite tracks without any additional equipment (cable not provided). 3) A built-in leveling screw/pedestal at the bottom-front can be used to tilt the amp: Tilting the amp helps the player to hear the sound better and it improves overall sound projection. 4) The built-in spring reverb is also tube-driven resulting in an authentic vintage style reverb for the authentic Chicago Blues sound. 5) Line-Out or additional external speaker? 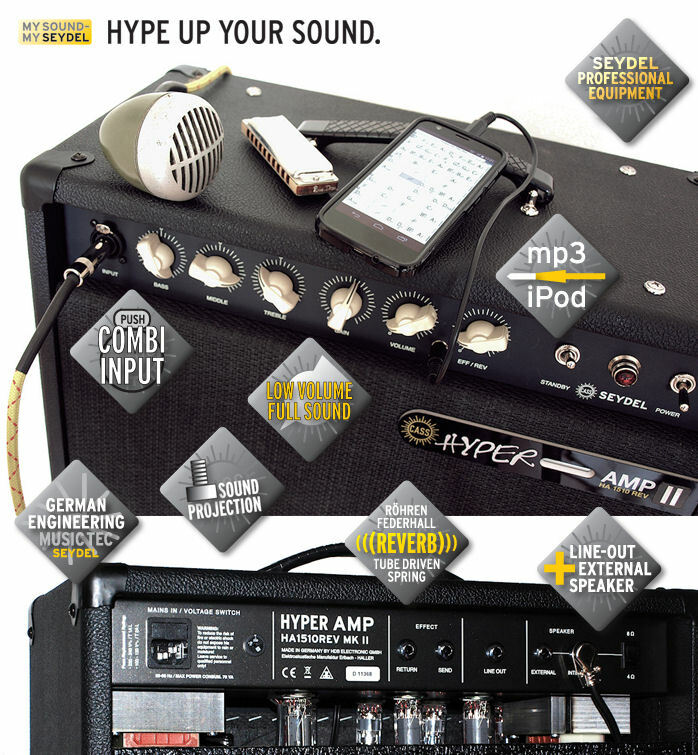 Your choice: the new Hyperamp MK II can be used on any stage no matter how small or large it is. 6) Combined INPUT: Guitar jack or XLR: All kinds of mirophones (high- or low-impedance) can be connected to the Hyperamp (built-in impedance transformer on the XLR-input)! Many amps are originally built for electric guitar or bass. By contrast the Hyperamp is is designed from scratch the specifical needs of the harp players! You and the Hyperamp create exactly the kind of harmonica sound that made the "electric harmonica" becoming "the mother of the band" (Otis Spann, piano player of the Muddy Waters Band). This impressive sound thrills players as well as the audience even today and many players are looking for their own electric sound. The amp follows all nuances which are produced by the player's harp and microphone. Therefore the Hyperamp is the ideal extension of the "sound chain". The Hyperamp HA1510 REV MK II is a hand-wired classA-amplifier and produces 15 (Tube-) watts. It is equipped with a specially designed 10'' Jensen "Alnico" speaker. An external speaker can be plugged in offering adaptability to play on any jam session, no matter if they have a small, medium, or a large stage. With its combined input (high-ohmic: 6.3mm socket or low ohmic: XLR) almost any microphone can be used, giving the player even more flexibility to create their own unique sounds. The well adjusted three-band tone control effectivily optimizes the sound characteristics. All kinds of mics can used with the Hyperamp, an AUX-input is provided for rehearsal or busking, the built-in tube-driven spring reverb is pure vintage - all these features make the Hyperamp HA 1510 REV MK II the natural choice for the ambitious harmonica player. * Through a second speaker jack an external 8 Ohm speaker can be connected, the impedance switch then has to be turned to 4 Ohm. In normal action without an additional speaker it is set to 8 Ohm. ** Applying the parallel effects loop the direct signal of the amp is mixed up with the effect's signal. The disadvantage is that some effects are limited (e.g. distortion). However the advantage is that the direct signal is directed to the power amplifier and therefore remains unaltered. If an external effect-pedal is connected to the EFFECT RETURN jack, the internal spring reverb is switched off.